On September 29th, 2018 our beloved mother, sister, aunt, grandmother and friend, Emmaline Gleason, journeyed home with Ma’heo’o, surrounded by her loved ones. Emmaline Gleason, Esetoohe’e “Calling Women” was born on November 4th, 1939 to Willis His Bad Horse and Josie Soldier Wolf. At a young age her and her siblings went to live with their Grandparents, John and Mary Soldier Wolf, in the Rosebud Creek area, she had many adventures riding her horses throughout the red hills of Rosebud. She lived in Montana most her life, until she ventured out to Washington and California but her home would always be in Lame Deer. She loved to cook, play bingo, pick berries, cruise out in the hills, visit with her friends, she was always traveling on adventures, from Tacoma Washington, to Gettysburg Maryland. Her love of the hot springs took her to Thermopolis Wyoming every year with her daughter Stella. They would always be on some adventure. 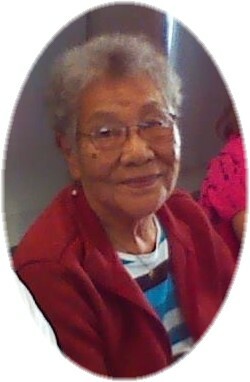 She enjoyed watching her grandkids dance at fourth of July Powwow every year while eating an Indian Taco. And for the past 3 years she would pass her knowledge of the Sundance on while sitting in the hot sun beaming with pride as her grandson David would dance for the family. Emmaline is survived by her 5 children: Stella (Tom) Corbin, Althea (Kenny) Gleason, Jennifer Gleason, Anthony (Renette) Gleason and her baby John Gleason. She took and loved as her own Ann (Porter) Knows His Gun, Amanda Whiteshirt, Robert Simpson and Emma King. Her grandchildren are what she was most proud of she had a total of 13, Danelle (Damion) Killsback, Marissa Yellowfox, Lindsey (Kevin) Larson, Adrian Gleason, David Roundstone, Marissa (Ty) Cuarino, Michael Sr (Sheila) Gleason, Thomas Sr. (Rhea) Busham, Kyle Gleason, Galloway Gleason, Nina Gleason, Antoinette Gleason and Janelle Gleason, Daniel Booker Jr, J’leesa and Tiffany Booker. Her sister Julitha Little Bird, Ruth (Ron) Burman, Marvena Soldier Wolf, Manford (Darlene) Soldier Wolf, Nephews Florris Medicine Bull (Kimberly), James HisBadHorse, Linwood HisBadHorse, Lloyd Jr. (Bobbie) Little Bird, Dorek Little Bird, Justin Little Bird, Nieces Fredonia (Rexx) Brady, Loylene Little Bird. Uncle, Roger Killsnight Sr. Aunts, Ethaline Killsnight, Irene Bearquiver and Rosella Killsnight. Special friends Lori One Bear, Hilda Moss, Barbara Bement, and Cecelia Limberhand. Emmaline had 18 greatgrandchildren whom she loved hearing about how each were doing. Our extended family included: HisBadHorse, Killsnight, Soldierwolf, Medicine Elks, Bearquiver, Braided Hair, Ridgebear, Manley, Two Moons, Wallowing, Evans and Fishers. She is proceeded in death by her Parents, Grandmother Mary Soldierwolf, sister Marie Medicine Bull, Molly Medicine Elk, grandsons Adrian Gleason and Tyler Bushman, brother Jack HisBadHorse, nephew Michael Medicine Elk and Larold Sr Little Bird, Ernestine Two Moons, Alice Wallowing. We have a large extended family, so we do apologize if we have forgotten you. Condolences and Prayers to Emmaline’s family and friends. She always a good person to me. The Alvarado Family ,would like to extend ,Our Deepest Condolences to all the Family. Prayers and Blessings to all. We want to extend our sympathy and prayers to the family.We spend sometime visiting during the time of David Waycie sundancing at the ceremonies. We talked of her youth in the Kirby area. I am glad that we had some time to get acquainted. Rest in peace, Blessings and Peace to the family. Gonna miss you Grandma Em! You were the rock and foundation of your family. I am blessed to have become an extended part of the family. Your great grandchildren are also blessed to have shared their time with you while at ceremony and during pow-wow season. I know you will be watching over us all. We will always keep you in our hearts and in our spirits. I always enjoyed hunting for you and bringing you deer and elk to cut and dry. I will miss sharing conversations with you the times I’ve visited you while I was back in Montana during the summer months and fall. I am very thankful that Danelle and the kids were able to share your last moments with you while you were here on this earth. Prayers for comfort..Emma was very special and I was so blessed to have her in my life..
Sending condolences to y’all, thinking of you in thought & prayer. I sure liked your mom, she was always so nice to me. She will be missed. Jen- I love you, hang in there my girl! Always, Candace. Fond memories of you Emmaline…..you worked and were as independent as ever …..tough on the outside but full of love on the inside…..I felt so sad to see you in pain…..I know you’re rejoicing with all your loved ones……no more pain…RIP my friend. My deepest condolences for all the family of Emmaline. I have fond memories and you’re no longer in pain. Prayers for all the family members and especially for my brother, JJ. Fly high Emmaline and I’ll see you again in the Next Camp. Deepest condolences to the family…… May the Lord comfort and hold you in this time of loss. I have fond memories of Emmaline…when I moved here in 1989, I went to Dull Knife College and she worked in the cafeteria, she was always greeting me with kind words and saying how proud of me that I was going to college with all of my kids, she just made my day when I saw her. She left an imprint of a heart in my life because she was always greeting me and talking to me when she saw me at the College. RIP Emmaline, you are in no more pain and you are rejoicing with the Angels. Condolences to Stella and her siblings.